Welcome to The Abso!ute Sound online! We explore music and the reproduction of music in the home. We believe that the sound of music, unamplified, occurring in a real space is a philosophic absolute against which we may judge the performance of devices designed to reproduce music. Our goal is to provide the resources consumers need to judge how a component's sound either honors or departs from the music's truth, and to make sound purchasing decisions that maximize their experience of reproduced sound. Below is our Issue 237, November 2013 table of contents and editorial. The Absolute Sound's Illustrated History of High-End Audio, Volume One: Loudspeakers nears completion! Steven Stone takes you step-by-step through configuring a Mac as an audiophile-quality music server. John Quick of dCS offers tips for optimizing your Mac's sound quality. Learn insider tips and tricks for optimizing your system's sound — without spending a dime. 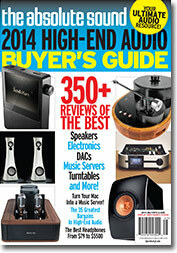 Robert Harley shows you how in this excerpt from The Complete Guide to High-End Audio (fourth edition). Our writers pick ten little-known but great-sounding recordings. We pick the most spectacular values in high-end audio today.